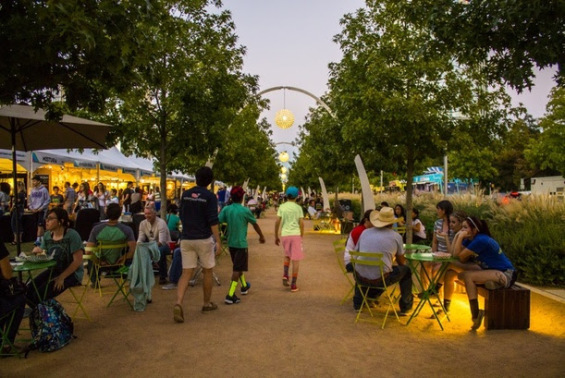 Urban Land Institute (ULI) has awarded Klyde Warren Park the 2014 Open Space Award, acknowledging the two-year-old park in Dallas, Texas as an outstanding achievement in urban placemaking. ULI’s annual competition recognizes successful public spaces that have socially and economically enriched and revitalized their communities. 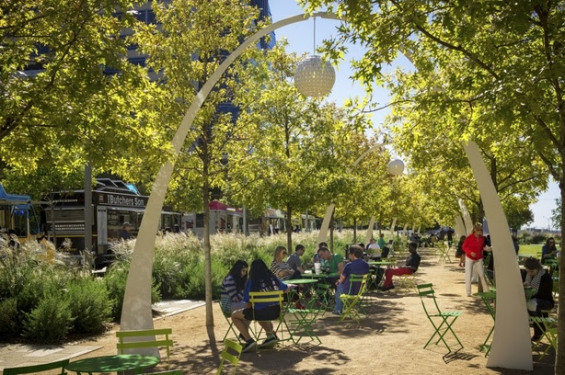 Klyde Warren Park, designed by award-winning landscape firm, The Office of James Burnett (OJB), was selected from five finalists. The Urban Open Space Award was established in 2009 through the generosity of Amanda M. Burden, former New York City planning commissioner and 2009 recipient of the ULI J.C. Nichols Prize for Visionaries in Urban Development. In recognition of the award, Klyde Warren Park will receive $10,000. 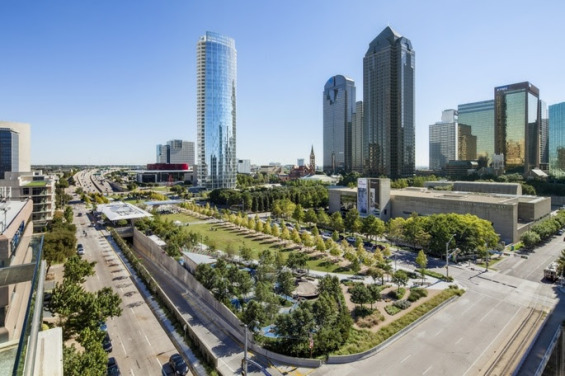 Completed at the end of 2012, Klyde Warren Park is Dallas’ new town square that has literally and figuratively bridged the city’s downtown cultural district with the burgeoning mixed-use neighborhoods to the north, reshaping the city and catalyzing economic development. Located in downtown Dallas, the 5.25-acre park decks over the sunken Woodall Rogers Freeway, which had been an imposing barrier between downtown and the densely populated Uptown neighborhood. The integrated design merges infrastructure, architecture, and landscape to create a vibrant public open space in the city center. The park promotes increased pedestrian accessibility and trolley and bicycle use between Uptown, Downtown and the Arts District, contributing to a more walkable city center. The park features flexible, pedestrian-oriented design, offering a mix of active and passive spaces, which include a children’s park, reading room, great lawn, restaurant, performance pavilion, fountain plaza, games area, urban dog park, and botanical garden around a sweeping pedestrian promenade. Daily free programming for the public ranges from yoga classes and lectures to outdoor concerts and film screenings. A model of sustainable park design, LEED Gold-certified Klyde Warren Park incorporates numerous green features, including the use of native tree and plant species; a water reclamation system and a double purification system; solar panels on the light poles and a high-efficiency lighting management system. The buildings use geothermal energy for cooling and heating, high efficiency light fixtures, recycled materials, and more. The Office of James Burnett worked closely with the park’s entire design and construction team, which, in addition to Thomas Phifer and Partners, includes Bjerke Management Solutions (Program Manager), Jacobs Engineering (Structural & Civil Engineer), Biederman Redevelopment Ventures (Park Operations Consultant), The Johnson Studios (Restaurant Interiors), Archer Western (Deck Contractor), McCarthy Building Companies (Park Improvement Contractor), Schmidt & Stacy Consulting Engineers, Inc. (Restaurant MEP Engineer), WARE Architecture (LEED Consultant), Endres Design Studios (Specialty Structural Engineer), and Fluidity Design Consultants (Water features). “Klyde Warren is not only successful in fixing an urban fracture that isolated development and challenged the existing potential for the area; it also demonstrates that a long-term vision and commitment are critical to foster a sense of place and community, with lasting positive rippling effects,” said M. Leanne Lachman, Chair of the ULI Global Awards for Excellence Jury and President of Lachman Associates. 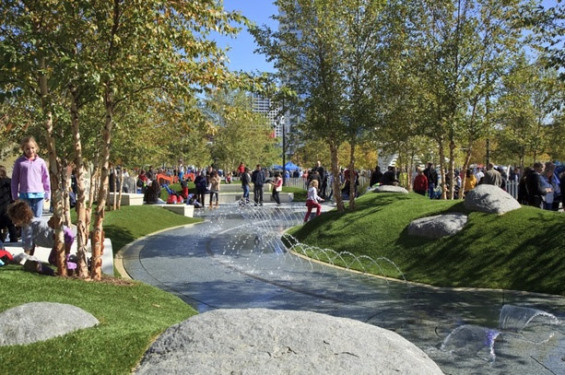 Other four finalists in the 2014 program included Columbus Commons and Scioto Mile in Columbus, Ohio; Guthrie Green in Tulsa, Okla.; The Railyard Park and Plaza in Santa Fe, N.M.; and Washington Park in Cincinnati, Ohio.